Thank You For Visiting Us At The Home Shows! The 2018 Home Show season has officially ended! 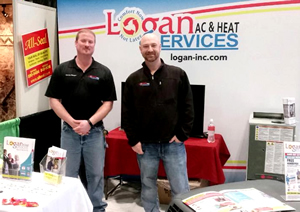 This year Logan A/C and Heat Services participated in three Dayton home shows, two Cincinnati home shows and two Columbus home shows. This is always an enjoyable time of year as it gives us the opportunity to meet you and show you the newest Trane, Rheem and Mitsubishi Electric heating and cooling systems. We hope to continue meeting new customers and making new friends both big and small. Say hello to Einstein the Newfoundland from Autmow. He’s a BIG fan of ours just as we are of him!